Essential Amino Acids & Anytime Energy! 6G Amino Blend, 2.5G BCAAs & 120MG Energy Blend! Part amino. Part energy. Entirely versatile. Use it in place of coffee in the morning or afternoon, a serving before a long study session, or a double helping before a tough HIIT cardio workout. No matter how or when you use it, R1 Pre Amino provides an essential amino acid boost and natural-source caffeine to help get you started and keep you going. 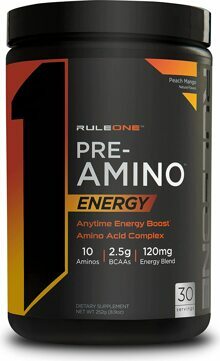 Is R1 Pre Amino an amino acid or pre-workout? When do I use R1 Pre Amino? Pretty much anytime except evenings when the natural source caffeine might interfere with sleep. Some suggested useage: morning wake up, pre-/intra-workout power, or mid-afternoon to help get you through the work day. 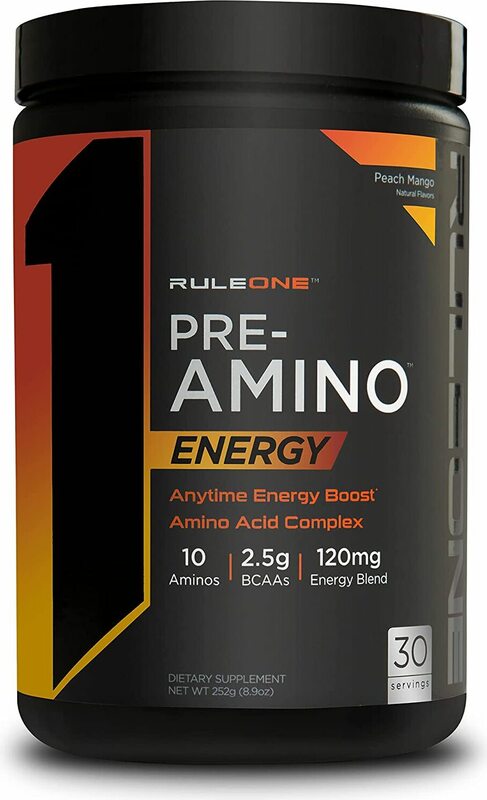 Which Rule 1 products does Pre Amino stack well with? Any of the protein powders (R1 Protein, R1 Whey Blend, R1 Casein, R1 LBS, R1 Gain), R1 Creatine, R1 Lean 5, and/or R1 Train Daily.